So this is a pretty interesting acoustic based cryptanalysis side-channel attack which can crack 4096-bit RSA encryption. It’s been a while since we’ve seen anything hardware based, and RSA 4096 is pretty strong encryption, I wonder how they figured this one out. It makes sense though when you think about it, although I wouldn’t have thought about it – I wasn’t even aware that processors made any audible noise when processing (even if the noise can only be picked up by a fairly high quality mic). Interesting that one of the researchers involved in this is also a co-inventor of RSA, but that’s also a good thing – showing they are constantly trying to find ways to improve it, break it etc. 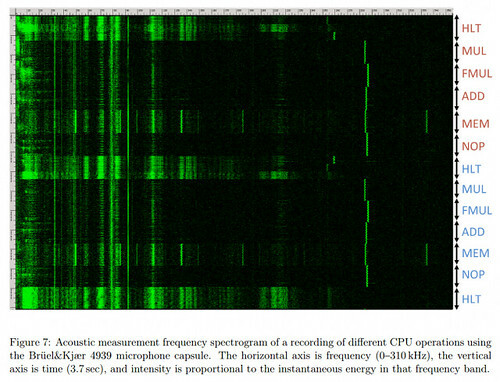 Perhaps all new encryption software will come with a feature to play some kind of white noise/music to disrupt any snooping of the high frequency CPU sounds. Thankfully it’s a very academic type of attack and doesn’t have much of a real world implication on the majority of folks, the method could be constructed for other algorithms I assume – using the same technique. But really, how many people sit around in public places decrypting sensitive documents? I don’t think there’s many. Hydra is a parallelized network logon cracker which supports numerous protocols to attack, new modules are easy to add, beside that, it is flexible and very fast. Teamspeak (TS2), Telnet, VMware-Auth, VNC and XMPP. And is faster in most tests than ncrack or medusa. SMTP, POP3, IMAP modules: Disabled the TLS in default. TLS must now be defined as an option “TLS” if required. This increases performance. So this is not a particularly technical source article, but it looks fairly interesting and I haven’t heard of this Linux.Darlloz worm before, so it might be new to some of you too. Seems like it’s going after old php-cgi installs, which are very common on embedded systems (routers/pos systems/stbs etc). The vulnerability being used is actually pretty old and was patched back in May 2012. It’s not really likely to cause a serious risk to servers, which tend not to run php-cgi any more – and it would be more common for them to be updated. “Upon execution, the worm generates IP [Internet Protocol] addresses randomly, accesses a specific path on the machine with well-known ID and passwords, and sends HTTP POST requests, which exploit the vulnerability,” the Symantec researchers explained. “If the target is unpatched, it downloads the worm from a malicious server and starts searching for its next target. I’m not exactly sure what the end game for this worm is, perhaps it’s just into spreading and doesn’t do anything particularly malicious. But in this day and age, that seems pretty unlikely. Infected hosts are more likely to be turned into botnet zombies for a DDoS network. It seems like it has infection vectors for non x86 architectures, but no actual infections on non PC devices have been confirmed – so the code might not even work properly. These architectures are used in embedded devices like home routers, IP cameras, set-top boxes, and many others. The firmware of many embedded devices is based on some type of Linux and includes a web server with PHP for the web-based administration interface. These kinds of devices might be easier to compromise than Linux PCs or servers because they don’t receive updates very often. Patching vulnerabilities in embedded devices has never been an easy task. Many vendors don’t issue regular updates and when they do, users are often not properly informed about the security issues fixed in those updates. It’s an interesting enough story though, something to keep an eye out for, but honestly I don’t think it’s going to spread very far – and it won’t do much damage. Only old and neglected machines will be vulnerable to the exploit. But well, as we know – there are far too many such machines plugged into the Internet. Sandboxie enables you to easily sandbox your browser and other programs, it runs your applications in an isolated abstraction area called a sandbox. Under the supervision of Sandboxie, an application operates normally and at full speed, but can’t effect permanent changes to your computer. Instead, the changes are effected only in the sandbox. For those too lazy to set up a full on vm image for testing stuff, this is a pretty good alternative. Enhanced Privacy: Browsing history, cookies, and cached temporary files collected while Web browsing stay in the sandbox and don’t leak into Windows. Secure E-mail: Viruses and other malicious software that might be hiding in your email can’t break out of the sandbox and can’t infect your real system. Registration is optional but there is a nag screen after 30 days (typical shareware style). Stuxnet 2 Under Development By Spy Agencies? It’s been a fair while since we’ve heard a mention of Stuxnet, so the potential for Stuxnet 2 is quite interesting. Of course at this point, it’s pretty much all just rumours – but still I’d be very surprised if such a thing wasn’t already in the works. Apparently in this case, it’s the Saudi and Israeli governments working together so develop something more powerful than Stuxnet, for the same end – to disrupt Iran’s nuclear program and facilities. Hold the front page: Saudi Arabian and Israeli spy agencies are developing a worm more powerful than Stuxnet to sabotage Iran’s nuclear program again, after meeting in Vienna last week. Sound a little far-fetched? Well, stranger things have happened but this particular yarn comes from Iran’s FARS news agency, thought to have strong ties to the country’s Revolutionary Guard, so a healthy dose of scepticism is probably advised. Citing “an informed source close to the Saudi secret service”, the agency claims that the November 24 meeting was held to “increase the two sides’ cooperation in intelligence and sabotage operations against Iran’s nuclear program”. “One of the proposals raised in the meeting was the production of a malware worse than the Stuxnet to spy on and destroy the software structure of Iran’s nuclear program,” the source told FARS, adding that the $1m plan was welcomed by the Saudis. The two sides had apparently set off on this hardline course after being frustrated by a warming of relations between the US and Iran and a deal struck between the Islamic Republic and the US, UK, Russia, China, France and Germany. This November 24 deal, branded a “historic mistake” by Israel, will see Iran agree to halt some of its nuclear activities in return for around £4bn in sanctions relief. The yarn certainly plays to the paranoia and FUD so often present in coverage of the Middle East, but it’s unlikely that Israel would want to anger its allies in Washington by jeopardising the recent rapprochement with Iran. Unless, that is, the idea is to have the malware all ready to go in case there’s a sudden breakdown in talks. A final thought: FARS lifted almost word-for-word an entire Onion story last year claiming most rural US voters would rather hang out with former Iranian president Mahmoud Ahmadinejad than Barack Obama. The agency’s editorial judgement was called into question again this year after it posted a story claiming an Iranian boffin had invented a time machine. If it follows a similar infection vector to the original Stuxnet tho, we probably would hear of it due to the massive Windows infections that precede the attacks on the industrial systems. And well the original ‘source’ of this news is rather suspicious to say the least, with them publishing satire as real news last year.